The Nuclear Waste Management Organization (NWMO) currently has responsibility for disposal of Canadian CANDU reactor spent fuel bundles. Ontario Power Generation (OPG) has responsibility for disposal of most of the other nuclear waste. This web page addresses various aspects of disposal of nuclear waste. Major problems with the original NWMO and OPG nuclear waste management plans are identified. Nuclear waste contains radio isotopes as a result of neutron absorption in or near a nuclear reactor. Radio isotopes spontaneously decay over time. Low Level Waste (LLW) contains radio isotopes with half lives of less than 30 years. High Level Waste (HLW) contains radio isotopes with half lives greater than 30 years. Intermediate Level Waste (ILW) consists of a mixture of HLW and LLW. Radio isotopes, if absorbed by the human body, are highly toxic. Hence persons working with radio isotopes take precautions to ensure that they do not inhale, ingest or absorb through their skin any radio isotopes. Persons in the proximity of gamma ray emitting radio isotopes should also be protected by adequate shielding. Protecting the public from radio isotopes involves long term prevention of inhalation, ingestion or skin absorption of the radio isotopes and protecting the public from gamma radiation emitted by these isotopes. Prevention of inhalation involves chemically binding the radio isotopes into a solid mass. Suppression of gamma radiation involves surrounding the radio isotopes by a sufficient amount of non-radioactive material to absorb the gamma radiation emitted by the radio isotopes. The most challenging aspect of public protection is long term prevention of ingestion. The problem is that radio isotopes, like many other materials, form chemical compounds some of which are water soluble. The long term challenge is keeping the radio isotopes separate from ground water. The radio isotopes need to be stored in containers made from rugged materials that have extremely low water solubility and extremely low water permiability. Also water needs to be reliably kept away from such containers by storing the containers in a naturally high and dry storage facility. The storage facility must be sufficiently robust to withstand many earthquakes and glaciations. The containers must be accessible for periodic safety inspections and to allow application of nuclear waste transmution processes as these processes are perfected. There are two competing nuclear waste disposal concepts. Up until September 2016 the original NWMO / OPG Plan was to place all nuclear waste in inaccessible Deep Geologic Repositories (DGRs). For HLW involving significant amounts of radio active isotopes with half lives up to 25,000 years that concept requires reliable isolation of the nuclear waste from ground water for over 400,000 years (16 half lives). The alternative nuclear waste disposal concept is to take advantage of the unique chemical/physical properties of uranium oxide to selectively extract uranium oxide from the spent nuclear fuel, to use fast neutrons to transmute the fuel residue from HLW into LLW, and then to hold the LLW in accessible dry storage for three hundred years while it naturally decays into stable atoms. The separated uranium oxide is used as a breeder reactor blanket fuel. The breeder reactor produces more LLW fission products which are also stored for 300 years. This alternative concept is known as the Ottensmeyer Plan, and is described on accompanying web pages. In September 2016 M.F. Ion and M.Gobien of the NWMO presented a conference paper titled: Some Implications of Recycling Used CANDU Fuel In Fast Reactors which may signal the commencement of a fundamental change in thinking at the NWMO in favor of the Ottensmeyer Plan. This author is particularly hopeful in this regard because posting of that paper on this web site was authorized by Paul Gierszewski, Director, Safety & Licensing, NWMO. 4) One thousand fold reduction in required spent fuel isolation and storage time. The NWMO has circulated various versions of a document titled "Implementing Adaptive Phased Management" which describes the NWMO's original plan for long term containment and isolation of spent CANDU nuclear fuel bundles, which contain a significant fraction of HLW, in a Deep Geologic Repository (DGR). OPG has promoted its own DGR for LLW and ILW storage. Serious technical and performance problems with the original NWMO and OPG plans are identified herein. Chief amongst these problems is that the DGR elevation originally contemplated by the NWMO and OPG is far below the local water table rather than far above the local water table, and the nuclear waste is not practically accessible for on-going confirmation of safety and for recycling of radio isotopes and their storage containers. b) external corrosion due to sulfur, oxygen and carbonate ions in ground water. CuFeS2, Cu2S, CuS, 2Cu2SCuSFeS, CuCO3.Cu(OH)2, Cu2O, CuOSiO2.2H2O. The NWMO is dreaming to expect that its copper coated steel containers will last a million years when buried pure copper water pipe undergoes readily visible corrosion in a few decades. Ground water everywhere in Canada contains significant concentrions of S, O2, CO3-- and HCO3- ions. Copper corrosion prevention requires total exclusion of these substances. This author believes that it is much less expensive to preprocess spent CANDU fuel bundles at reactor sites where the appropriate equipment and trained personnel exist. Relatively simple spent fuel preprocessing to selectively remove unanium oxide from the spent fuel will reduce the highly radioactive spent fuel mass that must be transported and stored about ten fold. Then it is economic to use highly stable porcelain instead of copper and steel for the outer long term storage container. It is practical to design a porcelain storage container to have a working life of one million years. The original NWMO plan contemplates inserting containers of unprocessed spent CANDU fuel into bore holes and sealing the bore holes with bentonite clay. This NWMO methodology makes spent CANDU fuel retrieval complicated, dangerous and expensive. It is much simpler, much safer and much less expensive to insert stainless steel containers of reprocessed CANDU spent fuel into larger porcelain containers which are in turn placed in a naturally dry naturally ventilated depleted granite mine vault using a heavy duty remote controlled fork lift. In this dry and naturally ventilated environment these containers remain accessible, safely release heat and can be engineered to automatically release internal accumulations of inert gases. Implementation of the original NWMO Plan has been projected by the NWMO to cost about $20 billion to permanently store the present Canadian inventory of 2.6 million spent CANDU fuel bundles. The cost of storage of low and intermediate nuclear waste by OPG is additional and based on recent relevant experience with the Niagara Tunnel this cost may exceed $5 billion. The minimum projected cost of implementing the original NWMO / OPG plans is about ten times the amount currently set aside from electricity rates for funding these plans. The original NWMO and OPG plans are also extremely wasteful of the finite copper, nickel, zirconium and natural uranium resources. A logical flaw in the original NWMO/OPG plans lies in the assumption that the most important issue in storage site selection is finding a "receptive community". That assumption immediately fails because any site that is sufficiently high and dry to be suitable for long term nuclear waste storage does not have sufficient ground water to support a permanent community. Hence, any "receptive community" will always have too much ground water and will have insufficient elevation differential to provide the natural ventilation required for safe and accessible long term nuclear waste storage. The original NWMO / OPG plans do not address the issue of initially selecting sites that are geologically suitable for secure and inexpensive storage of spent nuclear fuel bundles and other nuclear waste in a manner that provides sufficient natural ventilation, safe long term accessibility for economic ongoing safety certainty and that allows inexpensive material recovery for radio toxicity reduction processing, as well as reuse of containers, nuclear materials and DGR storage space. The logical flaws in the original NWMO Plan arose because the NWMO propagated multiple lies. One lie that the NWMO asserted is that it consulted with the Canadian public and as a result of that consultation it chose its "Adaptive Phase Management" plan. What the NWMO did not state is that in its consultation with the public it never presented the viable alternative method of nuclear waste disposal. The physics underlying the alternative spent fuel disposal methodology was developed at Atomic Energy of Canada Limited (AECL) prior to 1966. In 1966 nuclear waste disposal was not high on the public agenda and the government of Canada refused to fund related work on an Intense Neutron Generator (ING). The AECL ING Project team was largely disbanded. In 1969 AECL reports relating to ING came into the possession of this author. In later years relevant AECL data came into the possession of Prof. Peter Ottensmeyer, who used it to develop the Ottensmeyer Plan for CANDU spent fuel disposal. A key element of the Ottensmeyer Plan is selective extraction of uranium oxide from a hodge podge of other materials. It is this author's belief that this selective extraction process was originally developed by Kodak prior to WWII. Again there has been no NWMO acknowledgement of the existence of this key selective uranium oxide extraction process. At the 2013 hearings before the Joint Review Panel the public expressed almost universal opposition to storage of unpackaged nuclear waste below the local water table where it would likely eventually contaminate ground water. At the same hearings the NWMO experts revealed that up to the hearing date they had not seriously studied the proven alternate method of high level nuclear waste disposal via fast neutron transmutation. A second lie that was propagated by the NWMO is that a suitable DGR can be constructed underground almost anywhere. An issue not addressed by the NWMO is that in order to avoid ground water problems and to allow future waste accessibility the DGR should be located far above the local water table within high density crack free granite. Further, when the thermal emission of spent CANDU fuel is taken into account a DGR should be located within the granite core of a high mountain in order to provide the elevation differential required for positive removal of decay heat via natural ventilation. The original NWMO / OPG plans focus primarily on the politics of choosing a site within a "receptive community". Money is currently being wasted by both the NWMO and OPG on attempting to identify politically acceptable potential repository sites in areas that are inherently geologically unsuitable for long term safe storage of radioactive materials. The original NWMO / OPG site selection process fails to recognize that, for lack of fresh water, sites that are geophysically suitable for long term storage of nuclear waste cannot support permanent communities and hence are not included on the NWMO and OPG "receptive community" short lists. The original NWMO / OPG plans blindly reject the knowledge, experience and technology of the Canadian hard rock mining industry. The region around an existing major depleted naturally dry hard rock mine is subject to intense subsurface exploration to maximize the mine owner's return on investment. It is impossible for the NWMO or OPG to gain that degree of subsurface understanding at a new location without spending literally hundreds of millions of dollars on exploratory drilling and tunneling. It is almost certain that after spending all that exploration money the NWMO and OPG will find that any site chosen on the basis of "receptive community" criteria will be inferior from a safety perspective to the most suitable fully developed depleted mining properties that are available in uninhabited regions of Canada. The cost of acquisition of a major depleted mine in a remote area is a tiny fraction of the DGR budget contemplated by the NWMO and OPG. The original NWMO and OPG plans do not address the problem that subsurface limestone is often broken in a manner that is not apparent from exploratory core drilling. This problem cost Ontario Power Generation an unforeseen extra $700 million at the Niagara Tunnel. A similar problem with a similar cost over run was encountered at the Cleveland Dam to Seymour Filtration Plant tunnel in North Vancouver, B.C. The advantage of using existing depleted mine tunnels in granite is that the composition, quality, stability, durability and permiability to water of the surrounding rock is known with certainty. The original NWMO/OPG plans do not adequately address the three principal water penetration issues which are seepage, pressure and ion diffusion. All of the sites on the existing list of "receptive communities" have elevations with respect to the surrounding water table which are insufficient to exclude ground water. Hence a DGR located at any of these sites is inferior to Jersey Emerald, in BC even if there is extremely stable and low permiability rock. The original NWMO/OPG plans do not adequately address the issue of decay heat removal via natural ventilation. Establishing reliable natural ventilation requires a large elevation difference between the vault access tunnel entrance and the ventilation shaft discharge. This elevation differential is not included in the original NWMO/OPG contemplated storage vault design. As a minimum the NWMO and OPG should obtain core drill samples indicating suitable geological strata at a suitable elevation and should measure an acceptable seepage rate at the contemplated DGR study location before engaging in any political discussions relating to a particular site. At most places in Ontario there is a fresh water aquifer within a few hundred metres of grade and the available elevation differential is insufficient for good natural ventilation. Ontario rural residents rely on acquifers for potable well water. However, where there is an aquifer construction of the contemplated DGR is impractical. The acquifer will act like an overhead lake. 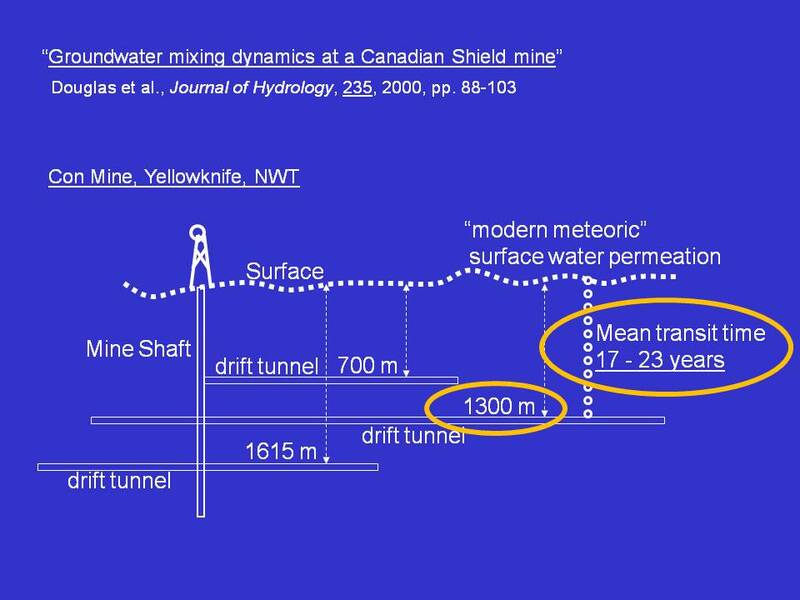 At the DGR depths presently contemplated by NWMO/OPG the resulting hydraulic pressure gradient is similar to the hydraulic pressure gradient within the WAC Bennett Dam, which is a highly engineered structure, not a natural sedimentary formation. 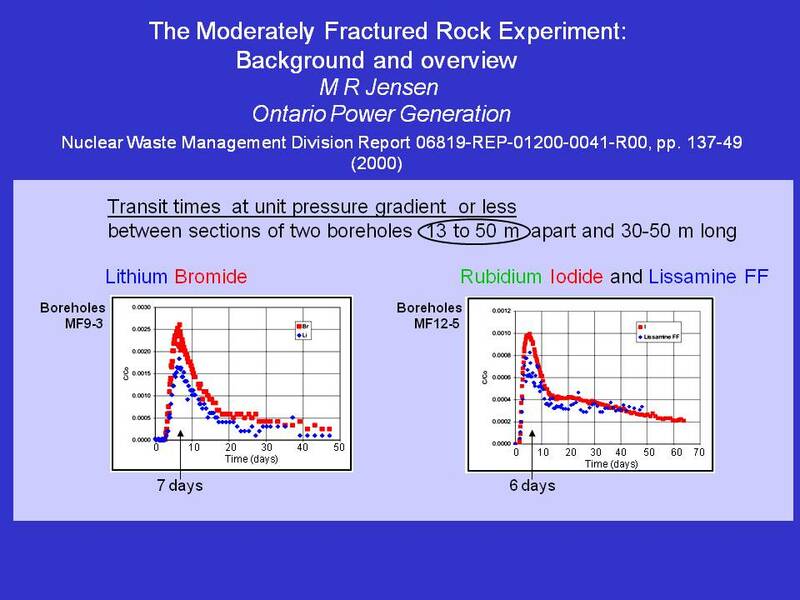 There will almost certainly be long term seepage problems that lead to premature DGR closure and post closure pressure problems that will lead to rapid radio isotope container failure and loss of radio isotope containment due to ion diffusion through water filled cracks in the surrounding rock. Absent sufficient natural ventilation there will be problems with heat accumulation and hence temperature rise in the storage vaults. A major problem with the original NWMO/OPG plans lies in misinterpretation of mass spectrometer data. A common method of initial site evaluation is core drilling. The rock obtained from the drill core can be heated to drive off contained water. This water consists of both liquid water from microcracks and water of hydration. The water driven off by heating can be analysed with a mass spectrometer to determine its (O-18 / O-16) ratio. The (O-18 / O-16) ratio in the water of hydration is an indicator of the amount of glaciation on Earth at the time the rock hydrated and hence points to the age of the rock. However, the age of the rock is not a good indicator of the age of the mobile water in the microcracks. The issue is that for tight rock the fraction of water of hydration is much greater than the fraction of water in microcracks. The binding energy for water of hydration is greater than the binding energy for water in microcracks. Hence the age of the water in microcracks may be orders of magnitude less than the age of water of hydration determined via mass spectrometer analysis. It is this author's belief that the NWMO/OPG personnel have been confused by mass spectrometer data. For tight rock this data is a reliable indicator of the (O-18 / O-16) ratio at the time the rock hydrated but it is not a reliable indicator of the (O-18 / O-16) ratio in the water in the microcracks. The original NWMO Plan contemplated enclosing multiple 0.5 m long X 0.1 m diameter spent CANDU nuclear fuel bundles inside cylindrical metal containers. Each such container would be placed within a borehole in sedimentary rock at a depth of 400 m to 700 m below grade. The bottom of the borehole, the annular space between the metal container and the borehole wall and the top of the borehole would be filled with bentonite clay. After the nuclear waste is so placed the DGR would be closed. The original NWMO plan lacked any specified relationship between the storage elevation and the elevation of the present or likely future water table. All the contemplated DGR elevations on the present NWMO short list are far below the present and future local water table levels. The original NWMO plan also lacked a proper study of the ongoing rate of heat transport from the stored fuel bundles to the surrounding rock and the related equilibrium temperature versus time within the fuel storage cannister and the bentonite clay. Bentonite clay relies on the presence of water to make it swell and seal. When bentonite clay gets hot its seal will likely fail. The original OPG plan contemplated storing LLW and ILW in the DGR with no intent to provide container barriers. The original OPG plan relied entirely on the quality of the surrounding rock for radio isotope containment. The fundamental problem with the original NWMO / OPG plans is the ill thought concept of locating the DGR far below the local water table with no recognition of the likely magnitude of future nuclear waste if fast neutron transmutation is not used for waste reduction. There is a high ongoing cost for pumping out seepage water as long as a DGR located far below the water table is open. There is certainty of hydraulic pressure induced container failure after a far below water table DGR is closed. Far below the water table the combination of seepage, hydrostatic pressure and ion diffusion make long term isolation of the nuclear waste from ground water impossible. The inaccessibility make future ongoing safety uncertain and make economic material recyling unfeasible. The NWMO concept of sealing bore holes with bentonite clay has problems. Bentonite clay has a proven track record as a sealing material in normal subsurface non-nuclear applications. When bentonite clay absorbs water it swells, making a fairly good seal. However, the nuclear waste continuously emits heat which causes the local temperature to gradually rise. As the temperature rises the clay will liberate water which will eventually cause the clay to shrink and the seal to fail. Practical field experience indicates that a spent nuclear fuel bundle storage facility located 400 m to 700 m below grade at a location where there is either surface water or an aquifer is neither economic to build nor feasible to keep dry in the long term. If the storage facility is not kept dry there will be a bio-safety hazard related to future containment failure and the spent fuel bundles will not remain economically accessible. Based on very recent history most of southern Ontario is relatively geologically stable. However, on a million year time scale this stability assumption is wrong, as is demonstrated by the existence of the 100 m high Niagara Escarpment, which is only 12,000 years old. Hence arguments for locating the DGR in Ontario based on claimed superior geologic stability have no merit. Based on well known chemistry, sedimentary rock, which is dominant in Ontario, is unsuitable for construction of a long term used nuclear fuel bundle storage facility. In the presence of water and dissolved carbon dioxide the CaCO3 component of sedimentary rock dissolves away too rapidly. In terms of protecting future generations the most important design targets are achieving a 1000 fold reduction in waste toxicity lifetime, a 100 fold increase in energy extracted per kg of natural uranium and reliable long term exclusion of water from nuclear waste. These objectives are neither attempted nor met by the original NWMO / OPG plans. The original NWMO / OPG plans contain multiple implicit assumptions that are not consistent with practical experience in development and maintenance of deep hardrock mines and major hydroelectric dams. Of particular concern is seepage of ground water into the DGR storage chamber while it is open, pressure triggered storage container failure after DGR closure and diffusion of water soluble radio isotopes out of the storage chamber after the storage containers fail. Other concerns are future inaccessibility of the nuclear waste for: safety confirmation, remedial measures and material recycling and insufficient natural ventilation. The original NWMO / OPG plans have no requirement that the deep geological repository be above the present or possible future water table. This issue is of great concern because any man made hole going 400 m to 700 m below the local water table, be it a mine or otherwise, will eventually flood and develop a large hydrostatic pressure head. All the contemplated DGR locations on the NWMO and OPG short lists are far below the local water table. The original NWMO / OPG Plans do not address the practical engineering issues and ongoing costs of keeping water out of the DGR while it is open or the high hydrostatic pressures that will prevail after the DGR is closed. In the original NWMO / OPG plans, as long as the DGR is kept open to allow radio active material storage and/or recovery, the DGR will be at constant risk of flooding and there will be a major on-going pump energy and maintenance cost for extraction of seepage water. The concept of locating the DGR close to the great lakes, or any other surface water body or aquifer, is wrong because in those circumstances it is impossible for the DGR seepage pumps to dewater the overhead soil and thus reduce the overhead hydraulic pressure gradient. This seepage rate is typical for mines that are far below the local water table. This ongoing electricity cost would increase with time as the seepage rate grows due to washout of fine sealing particles. There is also the ongoing cost of pump equipment maintenance and replacement. There is also the risk of DGR flooding due to a prolonged pump failure or electricity supply failure. The NWMO and OPG have failed to appreciate that in order to minimize water seepage in the presence of a large hydraulic pressure gradient the surrounding rock particle size has to be tightly controlled. This was a major issue in construction of the WAC Bennett Dam in British Columbia, which is the highest hydroelectric dam in North America. The problem of water sealing the DGRs as contemplated by the NWMO and OPG is more than two times greater than the problem of water sealing the WAC Bennett Dam which at its base withstands about (1/3) of the hydrostatic pressure that would prevail for a DGR 680 m below the local water table. The WAC Bennett Dam is not just a pile of random fill. The particle size as a function of position in the dam was tightly controlled during construction. In 1965 this author personally witnessed that particle size control and engineering discussions relating to this issue. Experience with large hydroelectric dams has shown that when there is a large hydraulic pressure gradient, over time seepage water washes out the fine sealing particles causing the seepage rate to increase. Uneven grouting magnifies this problem. In 1996-1997, after being in service for 30 years, state of the art compaction grouting was used to remediate the core of fines in the WAC Bennett Dam. However, the depth to which that grout had to be injected was less than (1 / 3) of the DGR depth contemplated by OPG. The physical configuration of the DGR as envisaged by the NWMO and OPG does not permit use of compaction grouting in the manner that was used at the WAC Bennett Dam in 1997. The problems relating to realizing the required grout field all around the OPG contemplated DGR may alone render the OPG contemplated DGR unworkable. Experience with grouted hydroelectric dams indicates that the DGR's seepage pumping rate will gradually increase with time until the pumping simply becomes uneconomic to sustain. At that point the DGR will flood. The typical time to grout failure in a well engineered hydroelectric dam is 30 years. However, a hydroelectic dam can be regrouted because the hydraulic pressure gradient is normal to the grout injection path. Similar regrouting is not feasible in the case of the original NWMO and OPG contemplated DGRs. Experience with hydraulic fracturing natural gas wells indicates that, after a few months to a few years in operation, in spite of the best efforts of the parties with grout and cement, seepage along the outside of the well casing causes unwanted vertical fluid flow. After an open period of a few years the NWMO and OPG contemplated DGRs will likely also fail in a similar manner forcing an early closure of the DGRs. This problem might be circumvented by rigid lining the DGRs, but the cost of such linings at the depths and hydraulic pressures contemplated by the NWMO and OPG is enormous. A problem with a short DGR open time is that it greatly increases the ongoing average cost of nuclear waste disposal and it renders impractical fast neutron techniques for reducing the waste toxicity life time and for increasing energy yield from natural uranium. The DGRs as originally contemplated by the NWMO and OPG are two to three times as deep below the water table as is the deepest existing undersea tunnel, which is the 240 m deep Seikan Railway Tunnel that connects two adjacent Japanese islands. The DGRs as contemplated by the NWMO and OPG are five to nine times as deep below the water table as is the 75 m deep Channel Tunnel (railway tunnel under the English Channel). The Seiken Tunnel, the Channel Tunnel and the Niagara Tunnel all used shotcrete immediately applied behind the tunnel boring machine to minimize seepage and have high strength rigid concrete liners, unlike the liner free construction that is contemplated by OPG for its DGR. The high strength liners with olefin plastic film water barriers balance the ambient hydraulic pressure, almost eliminating seepage. The Seiken Tunnel, the Channel Tunnel and the WAC Bennett Dam did not involve shafts or grout injection holes parallel to the hydraulic pressure gradient such as were originally contemplated by the NWMO and OPG. It appears that the NWMO and OPG do not fully appreciate the extent of geometrical constraints on successful grouting. The original NWMO and OPG Plans envisage storage chambers 400 m to 700 m below the present water table. After a contemplated DGR is closed the storage chamber will eventually fill with seepage water which will apply the 400 m to 700 m hydrostatic pressure head to the outside of the storage containers. This pressure is greater than the crush pressure of the most advanced military submarines. This pressure will collapse any void within the NWMO and OPG contemplated bentonite seals and in combination with corrosion will eventually collapse any void within the nuclear waste storage containers. The life of the storage containers could be enhanced by filling their voids with an incompressible liquid fluid, but that liquid fill was not contemplated by the NWMO and OPG. If the metal containers contemplated by the NWMO and OPG do not fail immediately they will fail over time due to corrosion from natural conversion of the metal into metal sulfide. There is some sulfur dissolved in the ground water almost everywhere in Canada. The bentonite seal will also fail due to the sudden increase in differential pressure across the bentonite seal that will occur when a nuclear waste container void collapses. Thus water soluble radioactive materials will mix with ground water. The original OPG chosen DGR location is based on hydraulic pressure measurements that are unstable or erroneous at depths below 450 m. The OPG claimed measured hydraulic pressures at depths below 450 m are not consistent with basic energy theory (In a stable fluid column the mass density never becomes negative with increasing depth). The erroneous or unstable pressure data may be caused by use of a piezometer and/or cable component at a pressure above its maximum rated operating pressure. The only certain solution to the combined seepage and pressure problem is to store nuclear waste above the highest possible future water table rather than deep below the present water table. The original NWMO / OPG Plan does not allow economic recovery of spent CANDU fuel bundles or nuclear waste for reprocessing and/or recycling after the repository is closed. The original NWMO / OPG Plan has no provision for ongoing access to the nuclear waste storage containers to provide ongoing certainty that no toxic material is escaping or is likely to escape if prompt remedial measures are not taken. The original NWMO / OPG Plan has no provision for ongoing status monitoring of each nuclear waste container. The original NWMO / OPG Plan has no provision for inexpensive access to the stored nuclear waste after about 300 years in storage to allow recycling of LLW material and reuse of storage containers and the DGR storage space. The original NWMO plan implicitly assumes that the NWMO can design the storage facility such that corrosive elements dissolved in ground water, such as sulfur, that trigger metal corrosion, will be reliably excluded from the metal containers surrounding the HLW for over 400,000 years. However, the original NWMO plan does not address practical realization of that exclusion. Sulfur in ground water will eventually corrode almost any practical metal container. Radio tracer studies have shown that once ground water contacts nuclear waste the water soluble radioactive isotopes rapidly migrate through the surrounding rock via micro cracks and grain boundaries. The following diagram provided by Peter Ottensmeyer, shows that even in high quality rock below the water table radioactive ions diffuse 13 m to 50 m in about one week. The Royal Tyrell Museum, which is Canada's foremost institution with respect to really long term geological preservation, has indicated to this author that "the sedimentary rocks will leak like sieves, both over the short term (decades-fluids migrating along fractures) and over the long term (centuries to millions-ground water circulation)." Mass spectroscopy of drill cores shows that the (O-18 / O-16) ratio of water of hydration in deep rock indicates that the trapped water is very old. However, this trapped water is chemically bonded to the rock under conditions of a zero hydraulic pressure gradient. That trapping says nothing about what will happen when due to DGR formation a large hydraulic pressure gradient is applied to the rock. This pressure gradient will create a network of micro flow channels along which radioactive ions can diffuse after the DGR fills with seepage water. Ontario contains or borders on 20% of the world's reserve of potable water. In most of Ontario there are aquifers that allow fresh water and water pollutants to move below grade. It is the height of stupidity to store nuclear waste in a manner that will significantly degrade drinking water quality for future generations. Displacement of fossil fuels is projected to require as much as a 100 fold increase in functional nuclear reactor capacity during the 21st century. Hence the problem with drinking water quality degradation is not the present level of contemplated nuclear waste burial. The problem is what happens when there are 100 times as many nuclear reactors that all must operate far into the future. Hence the issue of prevention of drinking water degradation needs to be faced now, not when the problem is 100 times worse. The original NWMO plan contemplates abandoning large quantities of copper and uranium in its DGR. The original OPG plan contemplates abandoning large quantities of nickel and zirconium in its DGR. However, extensive abandonment of those metals within DGRs introduces a new risk that at some time in the future the storage system will be compromised by greedy irresponsible parties that seek to recover the metals for their scrap value. Such parties would also break all the bentonite seals. Today we are not able to prevent theft of bronze plaques mounted in public places. What makes the NWMO and OPG think that one thousand years in the future it will be possible to prevent illicit parties from stealing thousands of tons of unguarded concentrated copper, nickel, zirconium and uranium? The only certain solution to the seepage, pressure, access, ion diffusion, theft and natural ventilation problems is to store nuclear waste in corrosion protected steel containers inside porcelain containers within a gravity drained Deep Geological Repository that is located inside a high granite core mountain far above the present and projected future water tables. The origin of the NWMO / OPG problems is rooted in political directions to the NWMO / OPG to the effect that NIMBY (Not In My Back Yard) political considerations take precedence over basic principles of chemistry, physics, engineering, mining, hydraulic dam construction, safety and security. In the original NWMO / OPG Plans there were implicit assumptions made that had no basis in fact. One of these implicit assumptions is that the NWMO / OPG can choose an unexplored site, primarily based on "receptive community" criteria, that can be used for construction of the contemplated DGR 400 m to 700 m below grade that will remain isolated from ground water and "geologically stable" for at least 1 million years. In this respect both the NWMO and OPG relied on subsurface hydraulic pressure data that this author has shown to be inaccurate or misleading at depths below 450 m. Further, neither the NWMO nor OPG calculated the required natural ventilation requirements of the contemplated nuclear waste storage facility. Based on political considerations the NWMO has considered potential DGR sites in Ontario and Saskatchewan. OPG has considered only one site in Ontario on existing OPG owned property. However, from an engineering perspective a DGR should be located inside the solid granite core of a high mountain to minimize ground water problems and to provide adequate elevation differential for gravity drainage and natural ventilation. There are no really suitable high mountains with solid granite cores in either Ontario or Saskatchewan. The NWMO has further multiplied the political problems related to storage of spent CANDU fuel bundles by indicating to aboriginal communities that there is a major opportunity for increasing economic activity in the selected community, when in reality the original NWMO plan makes neither engineering sense for these communities nor economic sense for the electricity rate payers that have to fund the NWMO plan. At some point there will be a severe political and economic price to be paid for the NWMO spending about $300 million of public money and making promises to aboriginal communities that are not founded in either engineering or economic reality. A cultural problem at the NWMO and OPG is the simplistic belief that if a long term nuclear waste storage methodology is thought to be acceptable in another country then that the methodology should also be acceptable in Canada. However, the laws of chemistry and physics do not conform to either government policy or popular opinion. Four hundred years ago it was then both government policy and popular belief that the Earth was at the center of the solar system and universe, even though at that time there was a century of conclusive scientific evidence to the contrary. It is our responsibility to reject both erroneous government policy and erroneous popular opinion in favor of scientific fact. Executive level persons at the NWMO and OPG who are not ready, willing and able to properly apply engineering and science to nuclear waste disposal should be terminated for incompetence and/or corruption. THE NWMO and OPG should obtain a new government direction to identify prospective DGR sites that are secure, high, dry and accessible as opposed to presently contemplated sites that are insecure, low, wet and inaccessible. Other desirable features are depth of rock cover, remoteness from existing population centers, a major existing room and pillar style depleted hard rock mine at a suitable elevation with respect to grade and the local water table, proximity of electricity, proximity of natural gas and proximity of road/rail transport. Another desirable feature is a location upstream from a major hydroelectric dam and an existing US radio isotope storage facility such that a radio isotope leakage would have no consequence on migratory fish. The NWMO and OPG should not concern themselves with political matters relating to site choice until after the NWMO and OPG have identified at least one geophysically suitable site. An advantage of an area that has had extensive past mining activity is that there is high certainty with respect to subsurface rock conditions and there may be suitable existing tunnels and vaults. A blunt reality that the NWMO and OPG will eventually have to face is that in August 2013 they both failed to either inspect or place a purchase deposit on the depleted Jersey Emerald mine property and the surrounding 4000 hectare security zone, which from geophysical, economic and international perspectives is by far the most suitable site in Canada for storage of medium andd high level nuclear waste. In August 2013 the then mine owner, Sultan Minerals Inc., and almost all of the property owners within an 8 km radius of Jersey Emerald were favorably disposed towards sale of Jersey Emerald for nuclear waste storage. The failure of both the NWMO and OPG to promptly act on that unique opportunity by placing a $2 million deposit on the mine property will likely go down in Canadian history as one of the most expensive Canadian nuclear management failures of all time. In spite of this major management failure the safest and least expensive long term solution to the high level nuclear waste disposal problem will likely be for NWMO/OPG to pay the new owner of Jersey Emerald, Margaux Resources Ltd., and Sultan Minerals Inc. AKA Apex Resources fees for use of the existing depleted Jersey Emerald mine and the surrounding security zone for interim and long term storage of CANDU spent fuel and other nuclear waste.